Each week, we look through the Sunday NFL results to find one team that’s rising, one team that’s sinking, and one team that stays at the same level. You’ll see these changes reflected in our weekly Football Relativity comparison of all 32 teams. Rise – Houston Texans – The Texans continued to stamp themselves as legitimate contenders by going on the road to win in Miami 23-13. Even though RB Arian Foster hasn’t been a force yet, the Texans are getting the job done. Most importantly, the rebuild defense is holding up quite nicely. Sink – Kansas City Chiefs – The Chiefs got their doors blown off in Detroit 48-3, and even worse they lost stud RB Jamaal Charles for the season with an ACL injury. The Chiefs have now lost Tony Moeaki, Eric Berry, and Charles for the season – that’s three of their best five players. We just don’t see any way the Chiefs overcome all these injuries to make a run in the AFC West. Float – Tampa Bay Buccaneers – The Bucs were in danger of falling to 0-2 as they trailed the Vikings 17-0 on the road, but Tampa Bay had an answer. LeGarrette Blount had a breakout game after a disappointing Week One, and the Bucs rallied for a 24-20 road win that lets them keep pace in the NFC South and more importantly stamps them as a legitimate playoff contender. No team has had a worse start to the season injury-wise than the Kansas City Chiefs. They lost promising young TE Tony Moeaki in the preseason, and then in Week One they lost another second-year player, S Eric Berry, to a season-ending torn ACL. Berry made the Pro Bowl after a rookie season in which he started every game and had 72 tackles, four interceptions, and 10 passes defensed. With Berry out, the Chiefs lose one of their major playmakers in the secondary. Now the defense must rely on OLBs Tamba Hali and Justin Houston to create enough havoc to make big plays. That’s going to be tough – which is part of the reason losing Berry is such a huge blow. The Chiefs brought back S Reshad Jernigan to fill Berry’s roster spot, and also added veteran blocking TE Anthony Becht to help fill Moeaki’s shoes. Now, let’s review the other transactions between Week 1 and Week 2. Panthers (put LB Jon Beason on IR; add DT Ronald Fields and OG Reggie Wells) – We discussed Beason’s injury in this post. The Panthers used his roster spot to add needed depth at defensive tackle with Fields, a veteran who can play on the nose. Wells replaces Max-Jean Gilles, released just before the opener, as the veteran depth on the O-line. Chargers (put PK Nate Kaeding on IR; add PK Nick Novak) – Kaeding suffered a season-ending torn ACL in the opener. He’s replaced by Novak, who has bounced around the league with mixed results. Steelers (put OT Willie Colon on IR; add OT Jamon Meredith) – Colon, the Steelers’ starting right tackle, will miss the rest of the season with torn triceps. He’s replaced on the roster by Meredith, a former Packers draft pick who has seen some action with the Bills. Rams (put CB Ron Bartell on IR; add CB Tim Atchison) – Bartell, the Rams’ best cornerback, will be sidelined for the season with broken bones in his neck. That’s a huge loss for a Rams’ defense that is otherwise soft at the position. Broncos (put DT Ty Warren on IR) – Warren, the long-time Patriot, suffered torn triceps in training camp, but the Broncos hoped to be able to hold a roster spot till he got healthy in November. But with Knowshon Moreno hurting, the Broncos needed the roster spot, and so they shelved Warren for the entire season. Dolphins (cut CB Benny Sapp; add CB Will Allen) – After Sapp gave up a 99-yard touchdown to New England’s Wes Welker, he was scapegoated and cut. He’s replaced by Allen, a long-time Dolphin who was cut in training camp. Bills (put WR Marcus Easley on IR; add WR Ruvell Martin) – Buffalo discovered Easley had a heart condition, and so they put him on injured reserve for the season. Martin, a veteran who was with the team in training camp, returns to add depth. Cowboys (add CB Frank Walker and FB Tony Fiametta; cut WR Laurent Robinson) – Dallas adds depth with Walker, who has bounced around as a veteran corner, and Fiammetta, a blocking fullback who spent the first years of his career with Carolina. Robinson, a speedster with a long injury history, was released. Texans (add WR David Anderson) – With Kevin Walter hurting, the Texans brought back Anderson to add depth at wide receiver. Giants (add WR Brandon Stokely) – The Giants brought the veteran Stokley in to fill a hole at the slot receiver position. He’s a veteran who will help the passing game thrive. Browns (put P Richmond McGee on IR; add P Brad Maynard) – McGee, who the Browns hoped would replace the injured Reggie Hodges, suffered a bad disc in his back and will be out for the season. Maynard, a veteran most recently with the Bears, takes over. Bengals (add TE Donald Lee) – Lee is a solid blocker with some receiving skills who fills the role the Bengals had signed Bo Scaife for. 49ers (add TE Justin Peelle) – Peelle, a blocking specialist, adds depth behind Vernon Davis. *Ray Rice didn’t find a ton of room running the ball for the Ravens (17 carries, 56 yards), but he did a great job in the passing game, as usual, with five catches for 42 yards and a score. It seems like Rice needs two or three steps to get going, but once he does, he’s elusive and hard to corral. He’s the best offensive player the Ravens have. But Baltimore got great performances out of TE Todd Heap (a franchise postseason record 10 catches for 108 yards) and WR Anquan Boldin (five catches, 65 yards, and a touchdown), among others. *Because the running game wasn’t thriving, the Ravens had to rely on Joe Flacco, and he did a good job getting the ball to receivers on crossing routes. The Ravens didn’t make a ton of throws outside, but Flacco killed the Chiefs on inside plays as he threw for 265 yards and two scores. Flacco has now made the playoffs in all three of his seasons and is 4-2 in the postseason despite not having a home playoff game yet. *Matt Cassel only threw seven interceptions all season, but he threw three in this game, including two early ones that doomed the Chiefs. Cassel still has a bright future, but right now the Chiefs don’t have enough offensive firepower to overcome these kinds of mistakes. *Chiefs RB Jamaal Charles made a huge play for the Chiefs with a 41-yard touchdown run in the first quarter, and his hustle play after a Cassel interception in the third quarter forced a fumble that Charles recovered. But Charles’ second-quarter fumble really stifled the Chiefs’ momentum when they had a 7-3 lead. *Despite the loss, this might have been the day that Chiefs OLB Tamba Hali became a national star. After finishing second in the league this season with 14.5 sacks, Hali had two sacks and a forced fumble against the Ravens, and a third-quarter pressure forced a field-goal attempt. *Ray Lewis is already a star for the Ravens, and he showed why in the third quarter with a hit on Dexter McCluster that forced a fumble and led to a field goal. He also had a late sack. Lewis isn’t quite as active as he once was, but he’s still an asset and a physical force. So is Terrell Suggs, who had two sacks in the game and provides a consistent pass rush. *Despite the loss, the Chiefs have a bright future, and it’s thanks in large part to their first-round picks. On defense, Hali, rookie S Eric Berry (four passes defensed), LB Derrick Johnson (huge stop in a first-quarter goal-line stand), and DE Glenn Dorsey all played well – all are former first-rounders. And on offense, OLT Branden Albert held up pretty well. The one first-rounder who went missing was WR Dwayne Bowe, who had a terrific year but didn’t make an impact at all in this game, going without a catch. *Michael Vick had a good but not great game for the Eagles. He threw for 292 yards, but aside from one chunk late in the game, he couldn’t get DeSean Jackson free for a big play. (Jackson was battling an injury.) Vick also threw a critical interception late in the game as he tried to bring the Eagles back. Vick ran for 33 yards, but Green Bay’s decision to spy on him with Charles Woodson kept the quarterback from breaking free very often. The Packers also sacked Vick three times, which was an accomplishment. *One of the things that makes Green Bay so dangerous is its depth of receivers. Greg Jennings, the Pack’s best outside man, had just one catch, but Rodgers still threw for 180 yards and moved the team effectively. 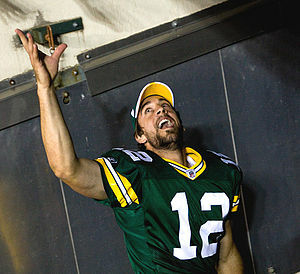 Rodgers’ willingness to spread the ball around definitely paid off in this game. OP: Can the Wests be won at home? One of the things you’ll see from time to time here at Football Relativity is our outlandish prediction. We’ll analyze things that seem far outside of the realm of possibility and try to decide if they’ll happen. In this post, we’re going to look at two teams leading the West divisions – the 3-0 Kansas City Chiefs and the 2-1 Seattle Seahawks. The thing these teams have in common, besides first-place standings, is massive home-field advantages. But can these home-field advantages lead these teams to division titles? Let’s look at the facts and then try to predict the future for these teams this season – even if that prediction ends up being outlandish. The Chiefs are off to a 3-0 start thanks to home wins over the Chargers and 49ers, along with a road win at Cleveland. Both home wins figured to be tough, at least when looking at the schedule before the season, so the Chiefs’ record is truly a surprise. While the Chargers and 49ers are slipping enough that we don’t want to read too much into these wins, the Chiefs have a lot more weapons than they did last year. Last season, the Chiefs claimed Chris Chambers off waivers from San Diego in a desperate attempt to add explosiveness to their offense. This year, that explosiveness is there in spades. Rookie slot receiver Dexter McCluster and TE Tony Moeaki have both proven to be dangerous targets (along with holdover Dwayne Bowe), and Thomas Jones adds some solid aspects to the running game while Jamaal Charles remains a threat to break a big run at any time. Those targets have helped Matt Cassel overcome a slow start. Suddenly, the Chiefs offense (under new coordinator Charlie Weis) is a legitimate NFL attack. And on defense, the addition of rookie DBs Eric Berry and Javier Arenas, along with bounceback efforts from former first-round disappointments DEs Tyson Jackson and Glenn Dorsey and LB Derrick Johnson, have made the Chiefs scarier to face. Tamba Hali, one of the few Chiefs’ first-rounders who had performed OK in previous years, had three sacks last week, and Brandon Flowers continues to be a pretty good cornerback. New coordinator Romeo Crennel has pulled the right strings and made the most of the talent available, which is a good sign. But will it last? Road games at Indianapolis and Houston after this week’s bye will probably drop the Chiefs to 3-2. But K.C. then has home games against Jacksonville and Buffalo, along with a winnable road games at Oakland and Denver, mean that winning six or seven of the first nine games is possible. If the Chiefs do that, steal another road game at St. Louis later in the season, and hold serve in five of their six remaining home games, they can get to 9-7 or even 10-6. That’ll be good enough to win the AFC West – to the point that we’ll now make the outlandish prediction that the Chiefs will in fact win their division. The Seahawks, meanwhile, are 2-1 after a convincing home win against San Francisco and hard-fought win over San Diego this week. This week’s seven-point win is due to Leon Washington’s two kickoff-return touchdowns, which is something the ‘Hawks can’t expect to do every week. Seattle’s offense has been OK, as Matt Hasselbeck has been healthy (which will be easier going forward now that OLT Russell Okung is playing), and TE John Carlson has emerged as a dependable target. Seattle needs receivers to emerge, whether it be reclamation project Mike Williams, promising rookie Golden Tate, or someone else. They also need a run game that produces more. On defense, offseason additions Raheem Brock and Chris Clemons have provided some pass-rush punch, and rookie S Earl Thomas has two interceptions already. The Seahawks have added to their talent base this offseason, although they’re not as far along as the Chiefs are. Still, Pete Carroll has undoubtedly put of jolt of energy into this franchise and the players currently on the roster. So where does that leave the Seahawks in terms of their division? Seattle is tied with Arizona with a 2-1 record, so the two games between the teams could mean a lot. Arizona is more talented than the Seahawks, but Seattle has more consistent QB play. For Seattle’s playoff hopes, this week’s trip to St. Louis is key, because it’s a winnable road game that can help the “Hawks get to nine wins. Trips to Oakland, Tampa Bay, Arizona, and San Francisco could also prove fruitful, and if Seattle can win a couple of those and ride home-field advantage to wins against opponents they should beat, big things are possible in Seattle. They’ll likely be favored in every remaining game at home except for perhaps Atlanta’s visit. But while the schedule looks good, our hunch is that the Seahawks’ lack of depth and premium players will cost them as the season goes along, and they’ll top out at eight wins. Maybe that’s enough to win a flagging NFC West, but our outlandish prediction still leaves Seattle out of the postseason picture. As the NFL draft wound down, and I tried to get Mel Kiper’s voice out of my head, I had an idea – let’s evaluate which NFL teams are rebuilding and which are reloading, and whether each team is taking the right approach. Here’s the AFC edition; the NFC edition is available here.